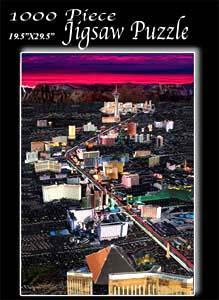 Back by popular demand, the famous Las Vegas 1000 piece jigsaw puzzle. Las Vegas vertical aerial view. When completed the puzzle measures 29.5 inches by 19.5 inches. The next best thing to living in Las Vegas. Absolutely gorgeous and suitable for framing. Includes FREE Shipping within the United States. Orders processed within 48-hours and shipped First Class mail. Regular retail is $29.95 per puzzle.